Everybody's Gone to the Rapture will feature "much more" interactivity than its predecessor. 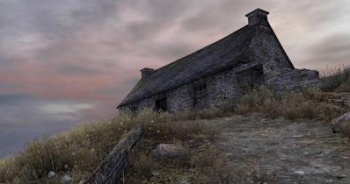 Released earlier this year, experimental indie game Dear Esther opened to profits and positive reviews, but one thing it lacked was interactivity. The game had a look-but-don't-touch policy, forcing players to travel a predominantly linear path through the detailed environments. The game's recently-announced spiritual sequel, Everybody's Gone to the Rapture, will be taking a different tack - developer thechineseroom is adding "much more" interactivity, allowing the player to actually change the course of the game. The game, slated for 2013 on the PC, is set in rural Britain - specifically, a small village in Shropshire county - during the apocalypse. The title centers around you and six other characters, who are "almost kind of memory traces of people that were there," according to thechineseroom Creative Director Dan Pinchbeck. These characters will act on their own accord, going about their business unless and until the player interacts with them. The characters' actions change the course of the game, so by interacting with them the player can affect events in the world. These events will all take place during a set timeline, as Everybody's Gone to the Rapture limits players to exactly one hour per playthrough. Since there's no way to see everything on offer in just an hour, especially with a game world that will take about 20 minutes to traverse corner-to-corner, the idea is to replay the game multiple times and experiment with what you can change. You may even be able to prevent the apocalypse - the team is still deciding whether or not to include that as an option - or, if you choose, you can just observe the story as it unfolds. Regardless of how or if it ends up happening, the apocalypse in Everybody's Gone to the Rapture will be relatively low-key. Pinchbeck explained that it wouldn't make as big an impact as most fictional apocalypses do, saying, "actually, if the world ended in a little village in Shropshire, it'd be inconvenient."